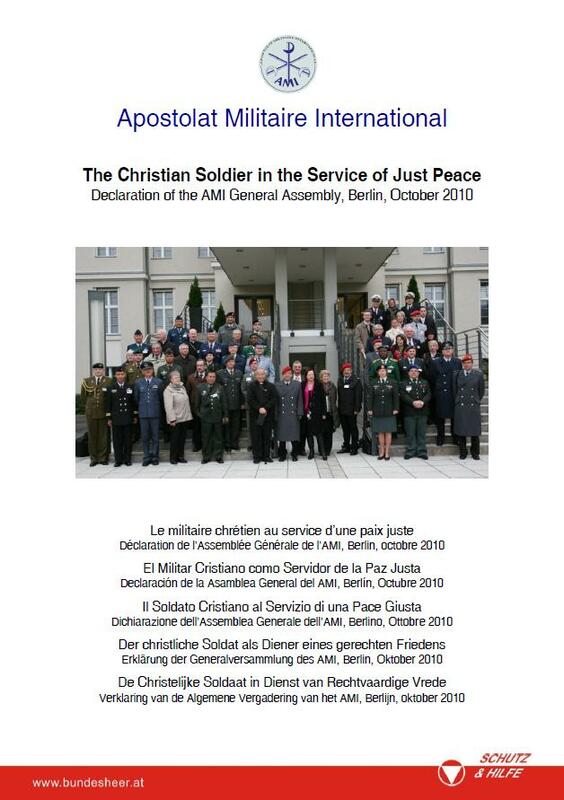 "The Christian Soldier in the Service of Just Peace” AMI’s Declaration of Rome in the year 2000, "The Catholic Soldier at the Beginning of the 3rd Millenium”, is a landmark paper for all Christian soldiers. Nevertheless, in the meanwhile so much came about, which changed the security-political conditions and hence the operational conditions for us soldiers worldwide. We, the members of AMI, consider it therefore necessary to update the answers given therein. The world has become even more global, including all risks and chances. Moreover, as predicted in the year 2000, secularization continued, fostered by the contribution of the church and their individuals. Additionally, the deployment of armed forces is increasingly determined by terrorism based asymmetric warfare, which requires new reference points for us soldiers. 10 years after the trendsetting Declaration of Rome the "Declaration of Berlin” is successful in this endeavour. From the AMI’s point of view, this paper will give any soldier reference to accomplish the duty of Gaudium et Spes: "Those too, who devote themselves to the military service of their country should regard themselves as the agents of security and freedom of people. As long as they fulfil this role properly, they are making a genuine contribution to the establishment of peace.” even under the new circumstances described above. Therefore, in regard to this paper I wish lively discussions on this subject matter and that its spirit will be lived by all of us!